Before the movie starts properly, Sunrise professes that life is sometimes bitter and sometimes sweet, and that is exactly what this film is; a bittersweet symphony of life and love. Flamboyant German director, F.W. Murnau directs this film with a great love and precision, his direction in the movie is flawless. Sunrise features very little story cards, and it almost totally told with just visuals and music. This is a testament to Murnau's talent for storytelling; to portray a story without dialogue is something that all silent films have to do, but to tell a story without many story cards either is something that many directors would struggle to do. The music in Sunrise is simply sublime; it fits what's going on in the film to a tee, and also succeeds in making the visuals' power more potent. 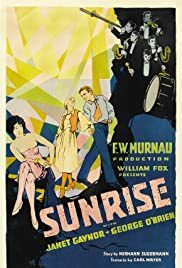 Sunrise is a groundbreaking film, some of the techniques used by Murnau to tell his story are amazing, especially for the time. Techniques such as his use of flashback have had a major impact on cinema as a whole. And the film isn't just a technical marvel either; there is more than enough substance here. The plot isn't massively substantial, but it's the subtext that is important. It follows the story of a man who, tempted by a woman from the city, gets talked into murdering his wife. Him and his wife used to be madly in love, described by their maid as 'being like children', but the love has since stagnated and so the man is easily taken in by an offer from a beautiful to move to the city. However, when it comes to doing the act; he can't do, and so the film moves into following the two falling back into love. Like life itself, the film is never plain sailing and that seems to be it's central message, along with the fact that love is more powerful than anything that life can throw at you. And those are welcome messages in any film, especially one as brilliant as this. Overall, Sunrise is a masterpiece. It easily ranks as one of the best, and most important silent films ever made and it is as brilliantly technically as it is on the substance front. A must see for all fans of cinema. 48 of 62 people found this review helpful. Was this review helpful to you?